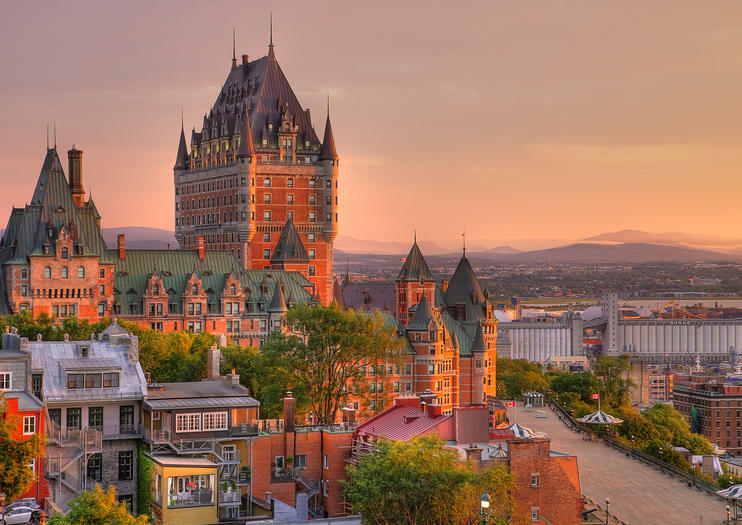 From the lush mountain forests of Vancouver's North Shore to the quaint cobblestone streets of Montreal and Quebec City, Canada has a city for every type of traveler. Here are a few of our favorites to help you decide where to go. Canada's most populous city is also one of its tastiest, making a name for itself as a go-to destination for food-loving travelers. Whether you're on the hunt for old-world flavors in St Lawrence Market or looking to sample dishes in distinctive neighborhoods such as Greektown or Leslieville, see below for some of Toronto's best food and drink tours. With nearly four centuries of history under its belt, Montreal is the perfect place to learn a bit about the past—including the original French explorers, a thriving 20th-century Jewish population, and more. For the traveler on the hunt for that next-level experience that will make everyone jealous, Quebec is the place to be. Embrace the cold and visit North America's only ice hotel, or see the historic city from above on a hot air balloon ride at sunset or sunrise. If your idea of a getaway involves fresh air and sweeping views, Vancouver is for you. We particularly love Vancouver as a hub for nature lovers, as you can see caves, cliffs, and wildlife on a safari cruise, or be really daring and try out ziplining at Grouse Mountain. If you're looking to check off one of the world's top attractions, head to Niagara Falls. Many argue that the three waterfalls straddling the Canada-United States border are best seen from the Canadian side, so go ahead and soak up the natural beauty on a boat cruise, a helicopter tour, or at night when the falls are lit up in bright colors. Some Niagara Falls tours are American and some are Canadian. Not this one. Get the full experience from both sides of the border on this deluxe, 6-hour guided tour of everything Niagara Falls has to offer. Visit all the must-see Niagara Falls attractions, from the thrilling Maid of the Mist boat cruise to the exciting Cave of the Winds walk — even a trip to the top of the Skylon Tower and much more. All attraction and admission fees, plus hotel transfers and road tolls are included. Food and beverages are at your own expense. Get to know the best of Niagara Falls, Canada on this 5-hour, small group tour. Led by a guide, visit some of the area’s top attractions. Check out the view from the top of the Skylon Tower and take the thrilling Journey Behind the Falls excursion. Then during the summer and fall months, get front and center with the water on an exciting Hornblower cruise, Canada’s most iconic visitor experience, to see Niagara Falls up close. During the winter and spring months, see the exciting Butterfly Conservatory and Niagara Fury. Hotel pickup and drop-off are included. Gain insight into Canada’s colorful heritage on this 2-hour Jewish history walking tour in Montreal. Follow your guide through Montreal’s Plateau neighborhood, where many Jewish people settled from the early days of the 20th century. Learn of life for the settlers in those early days and see where they lived, worked and worshipped as they built new lives for themselves far from home. Discover synagogues, schools, hospitals and cultural hubs built by the settlers, and hear how they helped shape the face of modern Montreal today.